The Open Compute Project aims to make future data centres more efficient and cost effective. It’s a truism in modern technology that the only constant is relentless change. However, anyone looking at data centre blueprints over the last two decades with this mindset would be in for something of a shock. In a world where innovation is a ubiquitous buzzword and cloud computing has changed many aspects of data centre usage, data centre design has largely remained the same. There are good reasons for this stasis - but with the progress of the Open Compute Project (OCP), this could, and indeed should, radically change. The economics of running a data centre have traditionally relied on getting as much value as possible from each square metre of space within it whilst keeping the whole system cool enough to be functional. Especially in areas where land values are high, for example in London, the efficiency and therefore the profitability of the data centre leans on the design and layout of the infrastructure and the clever management of these factors. This has historically led to a standardised design approach amongst most data centres, give or take marginal differences. However, developments from the work of the OCP are slowly changing the assumptions at the core of data centre design – for those who are paying attention to it. 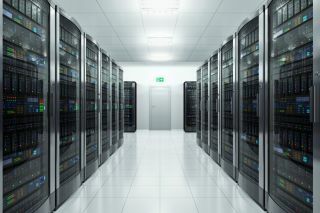 Currently, any data centre designer or architect is compelled to reserve a large part of the data centre blueprint to the rooms that house the uninterruptible power supplies (UPS), batteries, and generator. These fail safes guarantee the data centre’s functionality regardless of most mechanical and electrical errors that can occur, and the room where they are housed is arguably one of the most vital rooms in any data centre. It also represents a very large investment, both in terms of CapEx and OpEx costs. Meanwhile, the need for raised floor cooling in order to efficiently prevent the building from overheating eats further into data centre space. Data centre real estate is a fixed asset that data centre operators need to maximise – and the above factors represent big restrictions on what can and can’t be done. Enter the OCP - founded by Facebook, Microsoft, Intel, Rackspace, and Goldman Sachs, its mission is to alter how data centres are built with the goal of making them more efficient and cost-effective. IT infrastructure has historically been a ‘black box’, proprietary to its owners and inaccessible to everyone else. Where ideas are kept separate and siloed, new ways of doing things can’t evolve, and it is this that the OCP is attacking. It has taken the creativity spawned by the collaborative and accessible spirit of the open source software movement and applied it to data centre hardware, with exciting results. Two of its key innovations directly challenge the assumptions underpinning data centre design by altering the requirements mentioned above. OCP technologists have discovered a way to condense the battery into the server whilst retaining the functionality of both, reducing the need for a separate room with a centralised UPS system. Meanwhile, new ways of cooling the data centre solely using environmental and ambient elements erode the need for raised floor ceiling and take back yet more real estate. More room in the data centre means more space to focus on efficiency and innovation measures. Yet change is never simply a matter of technical possibilities. To achieve significant change and a break from the standard behaviour of the past, you need to alter people’s ways of thinking and take into account the human element. As emphasised earlier, the current norm for data centre design has become entrenched in the collective mind of the data centre industry over a period of around two decades. Few third-party data centres would automatically break with years of habit and normalised behavior to design a data centre without a UPS, generator, and battery room, or a raised floor. The need for these things is embedded in the industry’s way of thinking and the current mind-set is that these elements are absolutely necessary to keep the site running in the event of a power failure. Changing this view will be a long process – regardless how much black site testing is done. The key to changing mindsets is developing a set of norms around the use of OCP hardware and educating the industry. Although terms such as ‘OCP ready’ are already being heard around the industry, these are not always so helpful, especially as the Project themselves have yet to set out a clear. The terminology so far only conveys to potential customers that the data centre in question is capable of using OCP optimised hardware. There needs to be a standard which communicates clearly that physical alterations have been made to a site that enable it to take full advantage of OCP innovations. Data centre luminaries from Intel, Facebook, and Microsoft, amongst others, are working together on the OCP board to devise the parameters by which suitability for OCP hardware can be accessed and therefore a informative new standard for OCP optimised data centres can be unveiled. Conventional thinking can be overturned by education, and this will undoubtedly play a key role in helping data centre operators to rethink the possibilities of design and infrastructure. The first task of the OCP is to set out clear definitions of an ‘OCP Ready’ or ‘OCP Optimised” data centre. Once this has been achieved then data centre managers and designers can work towards these parameters. This will make it possible for the industry to conceive of a data centre without a UPS, battery, and generator room, as well as without raised-floor cooling. However, by illustrating the vast possibilities that these innovations can create, attitudes can slowly be shifted and correspondingly data centre design can be modified. Slowly but surely, we will see OCP start to make an impact as a key part of modern IT infrastructure.